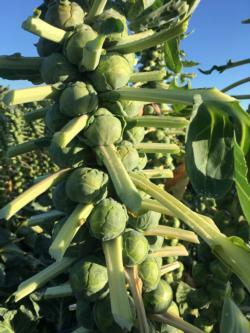 Brussels sprouts are a cool season crop, preferring temperatures under 70º F. Sprouts maturing in hot weather and/or dry conditions are more likely to develop bitterness. Transplant into the garden in Jul–Aug (possibly Sept). If grown from seed, start 4–5 weeks before desired transplant date. Sprouts form at the places on the stalk where the leaves attach. They are ready to pick when they are 1" in diameter and firm. Lower sprouts are ready first and should be harvested earlier than sprouts farther up the stem. Provide initial nitrogen fertilizer for growth, but avoid additional nitrogen after sprouts begin to form to keep the sprouts from splitting. Some growers like to remove the lower leaves, but it isn't necessary. Also: Cornell University has a Brussels sprouts variety listing developed as part of their Citizen Science Program.